Agree with everything except in first section you made no mention of the initial movement of hands(bat) to ball…which should be on a downward path. However, I agree that the bat has to get in the hitting zone as quickly as possible and stay there for as long as possible. When working with young hitters, I’ve found that the overwhelming majority have never been taught anything about bat path except to have a “level swing,” which usually has them dropping their hands to start instead of firing down at the ball. Correct, but the hands will create a path depending on where the pitch is. It’s hard to teach kids to fire down at the ball because they will immediately think to chop and hit ground balls. That would also create a positive bat angle at contact, which no pros have. 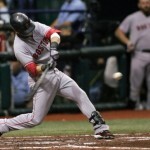 Your hands as a hitter should be coming through the zone after the hips have already opened to swing. The deeper the bat path the better! Excellent article…and written in a way that explains the mechanics that is easy to understand…My son has had excellent success, batting .475 with power in his freshman year, doing exactly what you have stated in the articles…can you provide some advice to give to my son, who’s swing is very similar to Mike Trout’s ,and plays in a highly rated high school program, unfortunately the varsity hitting coach preaches short step, no leg kick, swing down on the ball mechanics…now, my son is reluctant to go to off season batting practice because this coach is intent on changing his swing and he is feeling pressure…how should my son deal with this coach without being disrespectful or being seen as uncoachable?…thanks in advance! nice article! I find the initiation of the swing to be an interesting conversation. Initiate the swing with the top hand like Barry Bonds. Hands start low and the first move with the hands is up. It works to get a level swing. Classic. Initiate the swing with the bottom hand like Carlos Stanton. The hands are up and the first move with the hands is slightly back. It works to get a very level swing. That front arm is pretty barred. Ken Griffey Jr. had a similar move. 2 ways to skin a cat. Mix and match might not work as well.